Papergreat: Ruth Manning-Sanders rarity from 1930: "The Crochet Woman"
Ruth Manning-Sanders rarity from 1930: "The Crochet Woman"
I'm not sure which I'd love to have more: This gorgeous dust jacket from Ruth Manning-Sanders' 1930 novel "The Crochet Woman" or the novel itself. The book, published in 1930, is one of Manning-Sanders' first novels (she started her career primarily as a poet). 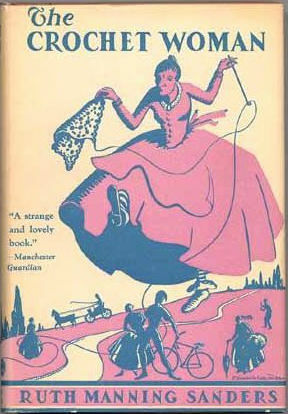 "The Crochet Woman" is described in several places online as a "novel of the English countryside and the works of a modern day witch, who accomplished with gossip and innuendo what earlier witches did with spells and curses." To me, it sounds like a less-vicious version of Stephen King's "Needful Things". "When the book arrived about a week later, I sat down and began to read. The story drew me in immediately, even though I quickly learned that the crochet woman (we never learn her name, she is always referred to as 'the crochet woman') is not a good person. In fact, she is quite evil, a witch, who uses her crochet work to cast spells on the poor folk who live in the countryside around her. I read the book in a single day, and I must say I enjoyed it very much. The ending was just what I had hoped it would be (no spoilers here, even though the book has been out of print for more than 80 years.) If you ever happen to run across a copy, be sure to pick it up. I am am sure you will enjoy it, too!" I think that just adds to my desire to read this book some day. It does, indeed, sound like the unnamed crochet woman might have been an ancestor of Leland Gaunt. Cool.